It is no secrets that knowing the history of the game and analyzing games played by the best players is a crucial ingredient of big success. In order to make your chess understanding deeper, it is important to learn the new techniques and ideas, especially from the great players. It was demonstrated over and over again that learning from the greatest players makes all the difference in the world if you want to improve at chess. And Magnus Carlsen is sure not a player to be missed out on this ‘Elite’ category; his achievements say it all! 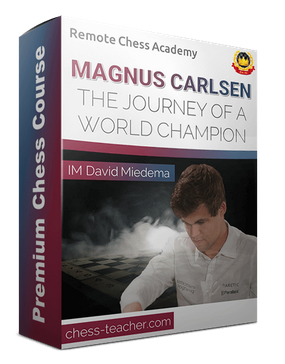 In this new course, IM David Miedema is breaking down some of the most instructive Magnus Calrsen's games, analyzes the critical moments and reveals how you can use the very same plans and ideas to score more wins in your own games! How to think and play amazing endgames using the "Magnus Method"
THE BOOK - PDF book covering contents of the course is included. IMPORTANT PLEASE READ: This one is not presented just as a set of videos but as a course that you can work through. So in the download you will see there a file "autorun.exe" which you double click and it will open up a nice graphical interface menu that will guide you through the course. This is a portable stand alone application and doesn't install anything on your computer. This graphical menu contains links out to the 7 video lessons, the practical tasks + puzzles and the PDF book version of the whole course. Use this menu and follow the presented instructions. If you don't want to view it as a course using the graphical interface and just want to view the 7 video lectures then ignore the autorun.exe application and you will find just the mp4 video files in the folder AUTOPLAY/VIDEOS. Solidfiles is a much better format as the links last a lot longer but I know that some members in India have been having trouble with solidfiles so I have also uploaded to Zippyshare links. I have had to split them into 200Mb files due to the Zippy sile constraint.